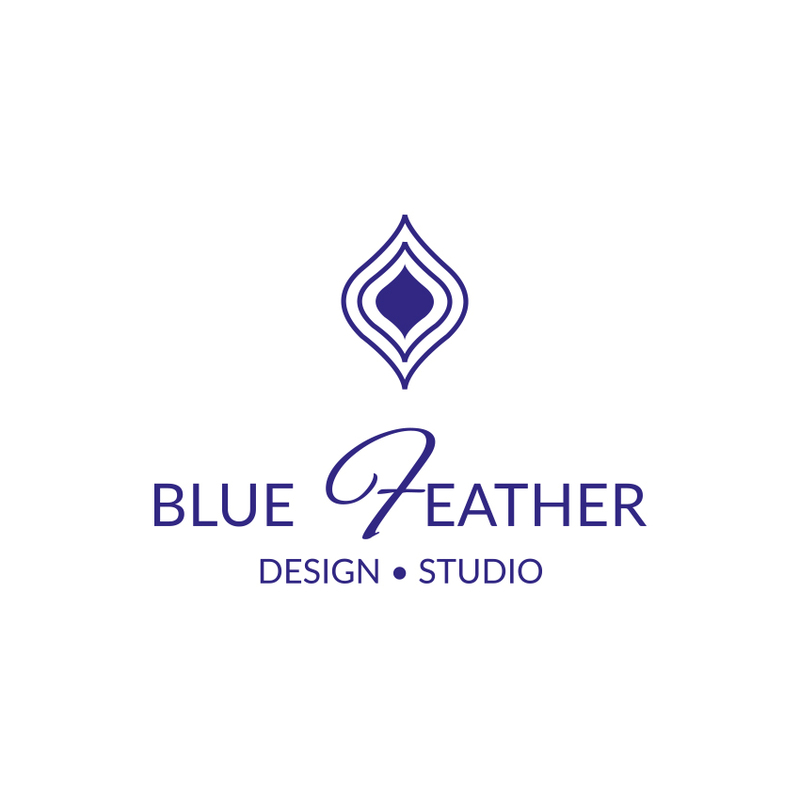 Blue Feather Design Studio, Interior Designer Ealing, London — Blue Feather Design Blog - How do you create eco-friendly Interiors? As environmental concerns are on the rise, people are reevaluating all areas of their lives. Whether it is the food you eat, the clothes you buy or the car you drive, however little attention is given to sustainable interiors. Something you will hear me say often, is that if you follow trends rather than your individual design aesthetic it will lead to constant wastage. Discarded décor items, furniture and furnishings continuously add to the landfill problem and it is an issue that needs to be addressed! 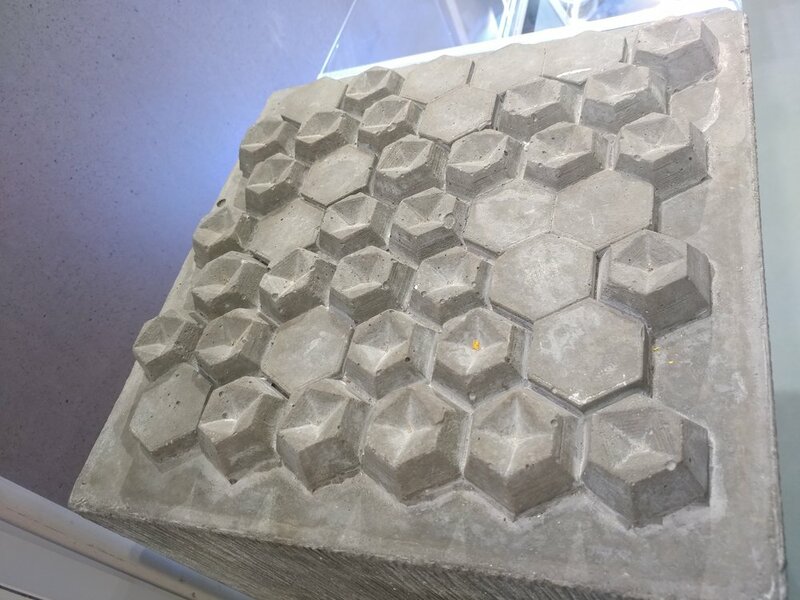 Luckily the market is taking action and designers are creating innovative ways to use and repurpose waste materials, but also create products that will help to create sustainable interiors. 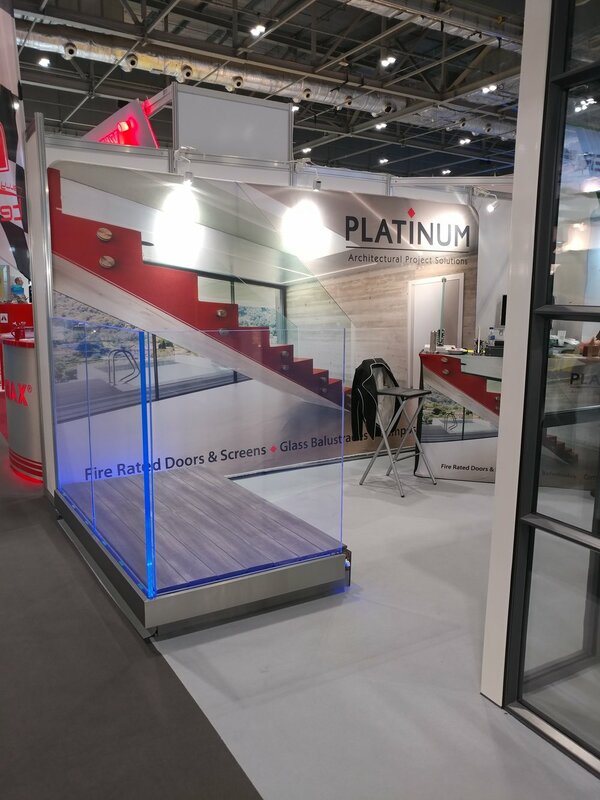 My recent visit to eco-build 2018 in London was an amazing opportunity to see what new initiatives are available on the market now. I am so excited to see what the future of interiors will be and am committed to help my clients make eco friendly decisions. According the World Health Organisation, over 15% of chronic diseases are caused by poor air quality. Every day we are all exposed to toxicity from harmful pollutants in the air. Shockingly Oxford Street and Marylebone Road are two of the most polluted streets in the world, the Mayor of London is taking steps right now to reduce the pollution in London. However, we are still exposed to this and need to take steps to improve this in our homes where toxicity can be up to 100% more than outside! Airlite has been formulating a highly sophisticated paint since 2003 and officially launched at Eco build this year. They claim their products are able to reduce air pollution by up to 90%, eliminates mould and prevents dust and dirt attaching to surfaces. With 14 accreditations, we do not have any reason to doubt these claims are true, and hope that this will be the beginning of a new era of wall coverings. Take a look at the video below to see how Ikea and Airlite joined forces to take steps to help the environment through the use of Art! Once upon a time the mention of helping the environment and looking after the planet conjured up images of hippies and tree huggers (I am not ashamed to say I am a proud tree hugger!). As the realisation of reality kicks in, that raw materials are becoming scarce and waste is more than we are able to cope with! Being environmentally friendly is now uber fashionable! The likes of award winning designer Brodie Neill are inspiring more and more designers to create beauty from rubbish. His Gyro table was created with a "Terrazzo" made from plastic washed up from oceans! 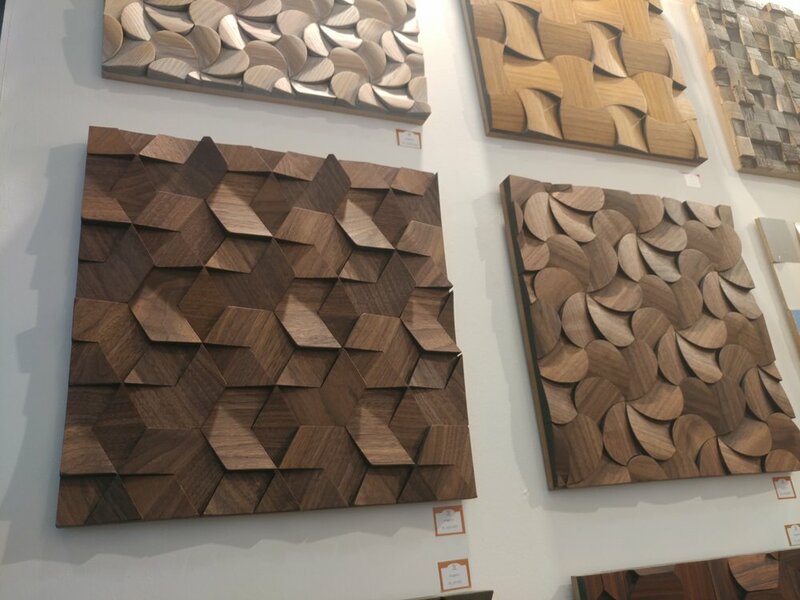 Design House Smile Plastic have used a similar idea to provide decorative panels for the architectural and design industries. With big names such as Selfridges and Stella McCartney as customers, I really do hope it will set a precedent for many more commercial designs. Yes amazing design comes at a cost at the moment. With larger scale production benefitting from economies of scale, the more people that adopt these materials the more cost effective it will become. I am on a mission to help educate more of my clients about the impact their design choices have on the environment, I would love for you to join me! A wave of upcycling hit homes all over the world with the likes of Kirsty Allsop creating beautiful furniture destined for the skip. Annie Sloan paint has become a household name as consumers realise how easy it is to repurpose furniture and give it a new lease of life. The satisfaction of not only saving something from landfill, but also creating something new and unique is quite a thrill. Next time you are thinking about buying new furniture, have a think. Could you repurpose an old piece of furniture? I always urge my clients to use local craftsman and tradespeople whenever possible, not only does this reduce the carbon foot print of your design, but it helps your local economy too! Whatever steps we take to make environmentally friendly design choices. The damage already done to our planet is something that cannot be denied. With the effects of global warming and flooding on the rise, it is imperative we think about taking steps to protect the existing infrastructure. 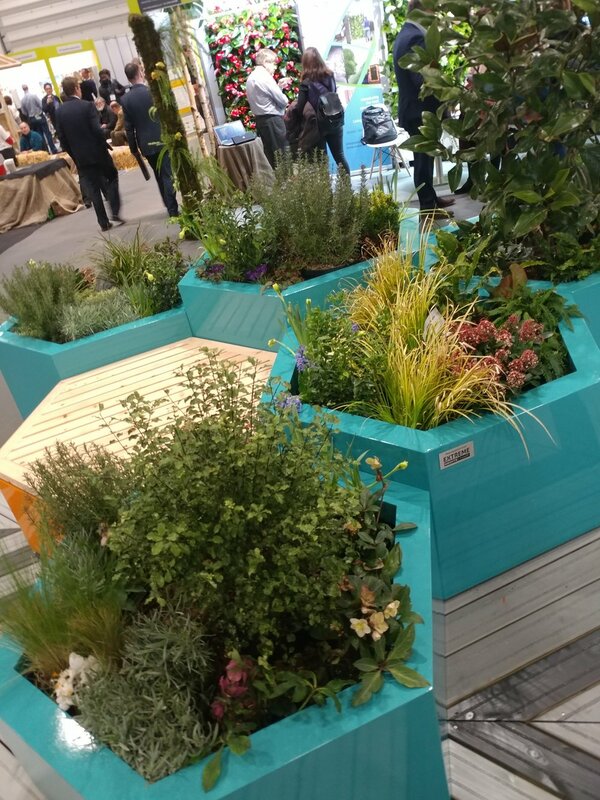 The Ecobuild show showcased a wide range of companies providing ground drainage solutions. The notion being, How could you protect infrastructure in the event of the cities flooding?! 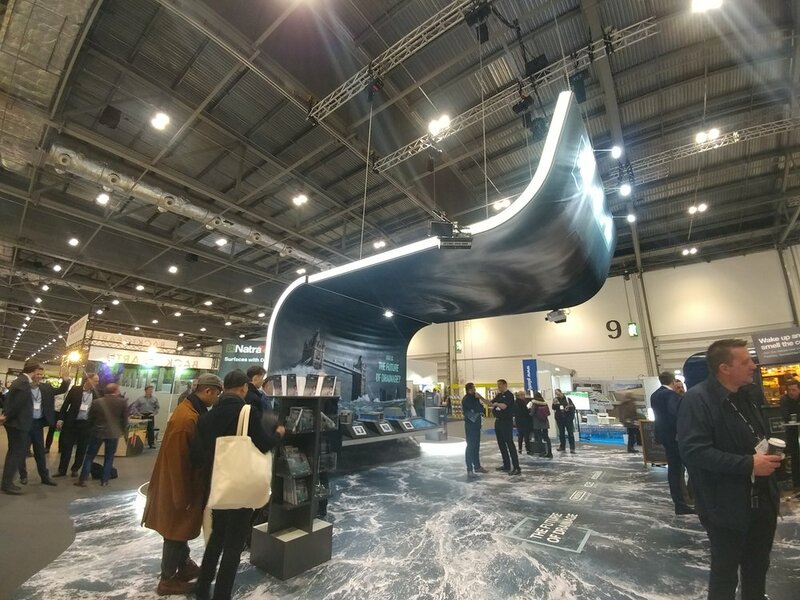 seriously impressive installation by wavin at ecobuild excel 2018!! Wavin had an amazing installation with a model of the city of London being flooded as you would expect to see in "The Day after Tomorrow" type of film! Sounds crazy, but it's a frightening reminder of what could happen in a society that all too often thinks "that won't happen to me!" This brings me onto the hottest trend at the moment; living walls! The application of living walls is extensive, and is a fantastic solution where space is becoming a luxury! Key advantages aside from beautiful aesthetics, are air purification and use of rainwater for easy watering. The modular walls are usually grown off site so installation is quick, easy and instantly breathtaking. I fear I could write a book on this topic, so am going to stop now and leave you with some more shots I took during my Ecobuild visit. Would love to know your thoughts, what would be the one thing you could adopt in your next design project? Comment below!